I would take chocolate over any dessert any time. BUT this raw carrot cake is delicious! Maybe it’s the sweet moist cinnamon-y bread. Or the thick lemony vanilla icing. Whatever it is, it’s amazingly similar in taste and texture to the baked version of a carrot cake. However, unlike the real deal carrot cake, this raw carrot cake is healthy and super easy to make. I recently took a trip to Europe where I visited several of my favorite raw food cafes and restaurants. Since I don’t eat out all the often, it’s always a grand experience for me. I love experiencing the smell of food as I step into the cafe, sitting down at the table, exchanging my first words with the server, and opening the menu. Raw food cafes are particularly appealing to me because they offer a wonderful range of raw desserts, smoothies, juices, and herbal teas. One of the raw food cafes I visited this year was located in Prague. The first thing I noticed on the menu was a beautiful photo of a raw carrot cake. Since I had never had raw carrot cake before, I immediately knew what I was gonna order. As soon as I placed my order, I could feel my expectations rising. I’m normally excited about raw food, but raw desserts – hold me back! When the server put the raw carrot cake in front of me, I was in awe. It looked so beautiful and absolutely indistinguishable from the classic baked carrot cake I know. I just hoped the taste and texture would be just as incredible and … it was. I couldn’t even tell this carrot cake was raw. The carrot flavor was completely overpowered by the warm embrace of cinnamon, nutmeg, and clove. It was moist and tender, but not so much that it fell apart into a million crumbs. Just amazing. The base of this carrot cake utilizes a natural sweetness of carrots and dates, a flour-like texture of ground and desiccated coconut, and a textural contrast of nuts. I am very pro-nuts in this cake because nuts add a bit of savouriness that help the spices balance all the sweetness. Speaking of spices – some people actually call carrot a spice cake because of all the bold spices it contains. The heady flavors and scents of cinnamon, nutmeg, clove, and ginger should take center stage. Make sure the spices are fresh because that’s what you’ll taste the most in this cake. The frosting is similar to a raw cheesecake filling. For the cream-like consistency, I use cashews because of their neutral (slightly sweet) flavor and a wonderfully smooth texture. Mixed together with some coconut milk and maple syrup, the icing becomes thick and lightly sweet. The coconut oil is essential in the icing as well as it creates a texture that melts in your mouth. It’s also one of the reasons you should keep this cake in the fridge (since coconut oil becomes liquid at a room temperature). 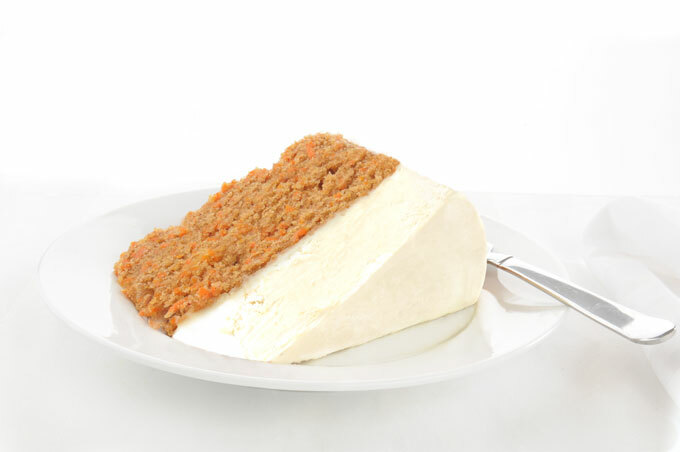 Because this carrot cake is raw, the flavor of carrots is quite prominent. However, despite the name of this cake, carrots shouldn’t be the starring player in the recipe. Their main role is to moisten the cake and add texture. So, use a small setting of your box grater or food processor’s grating attachment to turn the carrots into fluffy pieces. Aim for light and airy. The first time I made this raw carrot cake, I made it into a traditional style layer cake. It looked beautiful, but it was too much work. So, the second time I made it, I turned it into a simple two-layer carrot cake with icing just on the top. However, since carrot cake is known to be quite tall, I also used a smaller spring-loaded pan to make it – a 6″ (15 cm) tall spring-loaded pan works great for this recipe. Delicious, easy, AND healthy raw carrot cake that tastes like the real deal. Maybe it's the sweet moist cinnamon-y bread. Or the thick lemony vanilla icing. Whatever it is, it's amazingly similar in taste and texture to the baked version of carrot cake. Pulse the walnuts in a food processor until finely ground. Be careful not to over-process the walnuts. They should still retain some of their texture. Add the desiccated coconut, coconut flour, spices, salt, lemon zest, and pulse a few times to combine. Then add the coconut oil, lemon juice and, vanilla extract, and pulse to combine. Add one date at a time through the feed tube of the food processor while the food processor is running. The carrot cake mixture should be a little bit crumbly, but stick together when pressed in between your fingers. Finally, fold in the carrots. Press the mixture into a greased 6" (15 cm) spring form. If you are using anything other than a spring form, line it with parchment paper for an easier removal. Place the carrot cake base in a freezer while you make the icing. Add the cashews, coconut milk, melted coconut oil, maple syrup, lemon juice, vanilla and salt into a high-speed blender. Blend on high until the icing is smooth and creamy. Remove the spring form from the freezer and spread the icing on top of the carrot cake base. Place the cake back into the freezer for about 4 hours to let the frosting firm up. Once set, remove the cheesecake from the spring-loaded pan. Serve it frozen or let it thaw at room temperature for 10-15 minutes before serving. Store leftover carrot cake in an airtight container in the freezer for 1-2 weeks. *Squeeze out any excess juice from the carrots. If the carrots are too wet, they will make the cake too moist and dense. **Soak the cashews in water for at least 8 hours (or overnight) so they soften up and are easy to blend. To quick-soak cashews, pour boiling hot water over the cashews and soak for 1 hour uncovered. When the cashews are done soaking, drain the water and rinse the cashews thoroughly. (Note: if you do the quick soak, the carrot cake will no longer be raw). ***Prep time does not include soaking the cashews (8 hours). I made the recipe – absolutely delicious!! Tasted exactly like normal carrot cake! The only problem I had was the cake portion was a bit too gummy/no texture. Do you think I over processed the walnuts or added too much dates? Thanks! Thank you so much Amena! I really appreciate your comment. I changed up the ingredients a little but it still turned out delicious! Sorry, do you need a 6 inches spring form or a 9 one as listed in tools? A great question – the recipe measurements are for a 6-inch spring form. I now updated the “tools section” with the spring-form pan I used in the video. Thank you for catching that! Hi ive got all the ingredients except for the coconut flour, couldnt find in my area and i wonder if i can replace it with ragi flour which is millet flour actually? All things are very beatiful , @ this website, recipes are also, but sometimes I couldnt change the measurements to gr or ml, because our country measurements are quite different, I wish you write ml/ gr ingredients. And a question, how can you do white roses toppings? Thats all, Thanx. Thank you so much for the kind words! The fact that you find my website beautiful means a lot. The measurements conversion is on my to-do list, I promise. I apologize for the inconvenience. I know a lot of people use free online measurement converters, which are pretty accurate. However, if you ever have any problem finding the proper conversion, don’t hesitate to contact me. I am here to help. The white roses – I wish I could say I made them myself, lol. I bought them in a local raw food styling store. Thank you for the feedback, Beatrice. I really appreciate it 🙂 Glad they turned out great! Hi, I love this cake, it looks absolutely delicious and would like to make one, but I struggle with the American measurements (I’m French). Would you by any chance have the corresponding European measurements (with Grams instead of Cups) by any chance? That would help me a lot, thanks so much. Your videos are great btw! I just tried this recipe and it was fabulous! My non-vegan husband loved it! I did change the coconut flour (since I didn’t have any) for almond flour though. Worked out great. Thanks a lot for the recipe. Love your receipes so much! Just wondering, for the icing, could I swap the cashews for almonds? Hi Juh – yes, unfortunately that does happen. I just manually mix anything that’s still unblended (under the blade) into the rest of the icing and then let the food processor run once more to get completely smooth icing 😉 It happens to me with other things (like hummus, dips, nut butters, etc) too – not just this recipe. I used the topping as a filling for a baked carrot cake, because I didn’t want a dairy filling. One day I’ll try making the raw cake. If I do, I would put some topping halfway through the carrot part, chill then put the other half on top. Obviously for that I would need to use two tins. I made a chocolate topping of cocoa powder, coconut oil and maple syrup. Great suggestions, Ahuva! Thank you for taking the time to comment ❤ I have been thinking about making more than one layer carrot cake for a while but haven’t tried it yet. Petra I love this recipe of your carrot cake and can’t wait to make it for thanksgiving but I need to make it in 8” form like you did on the video do I double the ingredients? Outstanding! I’ve shared with my carnivore and conventional diet friends and this cake has been a huge hit! I understand why this 6 inch cake can be shared amongst many. Incredibly flavorful, rich and satisfying. I will definitely prepare again. Wow, this carrot cake looks awesome!! I love how you edit your videos and explain the recipes. Just a short question: Can I use shredded coconut instead of the desiccated one? Thank you for such kind words – so happy you’re enjoying the videos 🙂 Yes, you can. You will be able to detect the coconut more, but it will work just fine. As I do not have food processor, can I use Vitamix with dry container. I have stumbled upon your small videos in “Youtube” and instantly fell in love with them Thank you very much for making them. HI Lada – so happy you stumbled upon my videos 🙂 Hmm, I have actually never tried making the carrot cake in a blender. I frequently grind grains, legumes, nuts, etc. in the dry container. However, I am not sure if the Vitamix would handle the carrot cake base. I think that it will get clogged because there aren’t just dry ingredients. I have a friend who tried a raw pie crust in the Vitamix (using a tamper) and the Vitamix stopped after a few minutes of her running it. She unplugged it for 30 minutes, and it then worked fine … just something to consider (you don’t want to burn the motor out). Hello I am looking forward to making this cake however I did have a question regards the base side from the lemon juice you also add the 1/2 zest only? I did not see that part on the video? Hi Edith – I might have skipped the zest in the video. My apologies for the confusion. You can leave it out if you’d like though. It will just add a nice lemony flavor to the cake. Dear Petra, I really love the baked version of carrot cake and one time I made it without sugar but it was dried you know…not fluffy and moist. When I saw your recipe I desiced to try to make it raw. To be honest me and my husband were relally surprised about the wonderful texture and taste it had!!! Your version of raw carrot cake is a very successful version in it is so delicious cake!!! Thank you very much for that recipe as well! 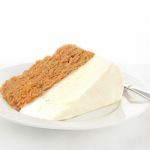 We loved this carrot cake and I’m going to make it again and again! Thank you so much for such a lovely comment. 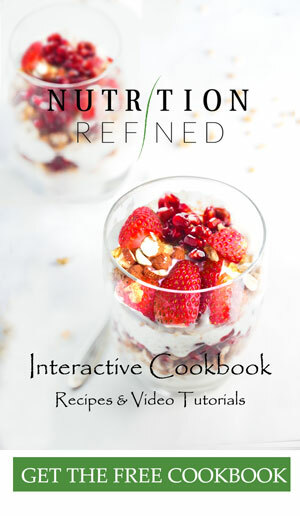 I am so happy you and your husband are enjoying all the recipes, Evgenia! Oops…. lol…. never mind. I wrote it wrong. It is your first ingredient. Raw walnuts. Excited to try this. Have to buy the spring pan but I think it’s going to be great. hello all the way from Palestine. tried it, and it was a big hit. the cream was a bit thick, but that much more delicious. perhaps didn’t put enough coconut milk, but it all worked out well at the end. Hi Petra, once again you nailed it! I have one question :what can I use to substitute the desiccated coconut/shredded coconut/coconut flakes? It’s hard for me to find any of those unsweetened, or at least healthy. What do you use the dessicated coconut for? Is it for consistency or to substitute a part of a flour? I want to know so that I can have an idea of substitutions. Thanks so much! We love your recipes a lot!!!!! So happy you love the recipes! ❤️ Yes, absolutely! You can substitute the desiccated coconut for any coarsely ground (or finely chopped) nuts. I used the coconut mainly for texture. Ground nuts are fairly similar to desiccated coconut not only in texture, but also the amount of natural oils they contain. After making your fudge with the medjool dates tonight, I realized I am not a fan of dates. Might I be able to substitute pineapple for least half of the dates called for in this recipe or perhaps with the other spices is the date flavor toned way down? Getting ready to make this cake. Hi Diane – are you thinking of using dried pineapple? I have never tried pineapple as a substitution for dates. The best date substitute for dates are dried figs or raisins. The date flavor in this carrot cake is definitely less pronounced than in the fudge recipe, but you might still be able to detect them (especially if you’re not a fan of dates). Is it possible to mix the carrot with the base of your lime pie recipe? Although I like the taste of the carrot cake I do miss a crunch. I LOVE your recipes!…and this carrot cake is AMAZINGLY delicious! I’m a foodie (food lover), and have a real sweet tooth. I would’ve never dreamed of substituting my sweets for anything but this cake is so worth it! What kind of coconut oil and desiccated coconut do you use? Hi Jocelyn – it doesn’t really matter what brand you use. At the moment I am using Nutiva virgin coconut oil and Bob’s Red Mill unsweetened desiccated coconut.